Since I could first walk, it has been a family tradition that my Nan and I go strawberry picking every summer. 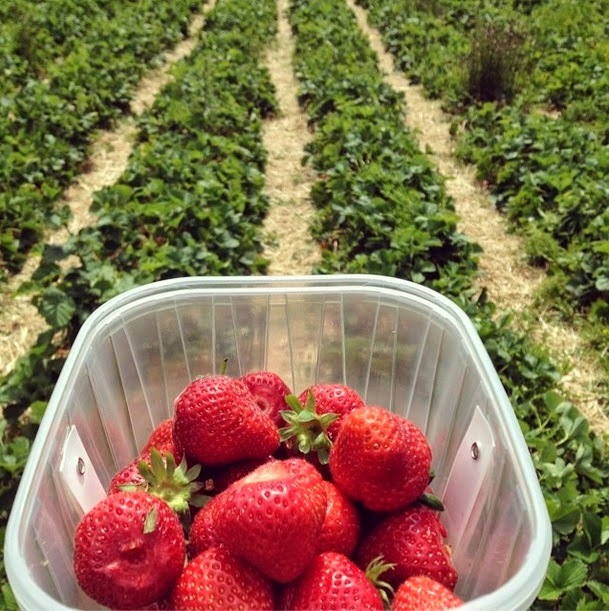 Every year without fail, we've been to Peterley Manor farm to pick the best of the strawberry crop underneath the summer sun. Situated in Prestwood, Buckinghamshire, this lovely little pick-your-own farm now has a pop-up cafe filled with delicious cakes and a refreshing selection of teas served in delicate china cups. It's truly idyllic; beautiful, great fun, and a wonderful day out, especially if you have young children. The only berries available at this time of the year were strawberries, raspberries and gooseberries, but we definitely picked our fair share of the first two! I think the strawberries were £3.80 per kilo, while the raspberries were £6 per kilo. I had a large punnet of strawberries, and around half a large punnet of raspberries, topping up a total of £5.29. This is considerably cheaper than supermarkets, especially as I had quite a lot of fruit and got to pick and choose exactly which berries I had, avoiding the inevitable few mushed up strawberries in a shop-bought packet. Even better, we sneakily ate a few strawberries on the go...we were only testing their quality, of course! My Nan's friend, Pat, joined us on our berry-picking mission, and both of them stocked up on raspberries as they freeze very well. Pat said she's only just got through the load they picked last year! I think we must have chosen the hottest day of the year so far to go to the farm, as the rays glared down of us as we hunted down the perfectly ripe strawberries catching a bit of shade underneath the plentiful leaves. After our hard work, we'd had enough of the sun so decided to go to the Polecat Inn for a bite to eat. This beautiful pub is pretty much across the road from the farm, so very convenient after we'd worked up an appetite. Pat and I struggled to put up the umbrella in the middle of the bench while we waited for our lunches of baguettes and jacket potatoes. Of course, the day wouldn't have been complete without a refreshing glass of shandy out in the pub garden to complement our lunch. We sat, sipped and chatted for ages, enjoying the warmth from underneath our shade while the sun lasts. It was a perfect day filled with beautiful scenes, fruit and people. Bacon, chicken and salad baguette...yum! A refreshing glass of shandy. If you have small children in your family and want a lovely summer activity, then pick-your-own farms such as Peterley Manor are ideal. It's fun, rewarding and a fab excuse to get out of the house and do something productive that isn't 'work'. Plus you can top up your tan at the same time! Doesn't fruit just taste ten times nicer when you've picked it yourself?! I love strawberry picking! I always want to go every summer and then never get round to doing it because I'm so busy :( It looks like you had a wonderful time! That's so handy to have one of your own, sounds lovely! Frozen fruit is the best!